Abstract in Nature – Is there a face in there? I am currently working on the post-production for a StillWalks video in Cwmdonkin Park in Swansea. It is a while since I was able to look at the photos and I was surprised to come across the image below. 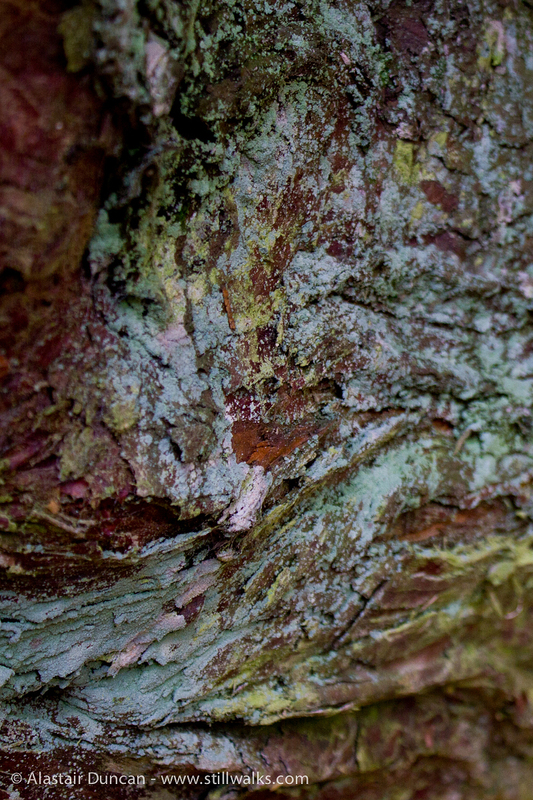 It is not one that I am likely to use in the video but I love the abstract nature of this tree bark. The colour and texture make it a painting for me, one which makes me feel a little uneasy! Is that a face in there? Can you see it? Posted in art, Nature, Photography and tagged abstract, art, colour, Cwmdonkin Park, face, painting, photography, stillwalks, Swansea, texture, tree bark, trees, UK, wales. Thanks for hunting for it. The face that I see is quite large in the image – central in the top two thirds, well camouflaged and perhaps not the most friendly of faces. It makes me think a bit of the “bog people” where bodies have been preserved for millennia but this one is definitely part of the tree! I guess is all about the zoom you use and angle…i stick with my… face, is the only one I can see it. :) Indeed great interpretation.